The Prevost H3-45 is the company's main model of motor coach used for charter service and scheduled line runs. Often referred to as the "gold standard" in charter buses, this model features nearly every amenity imaginable. From strong safety features to fast Wi-Fi and power outlets, these vehicles were designed with the consumer in mind. Reliability is also a selling point for many companies who purchase these vehicles. 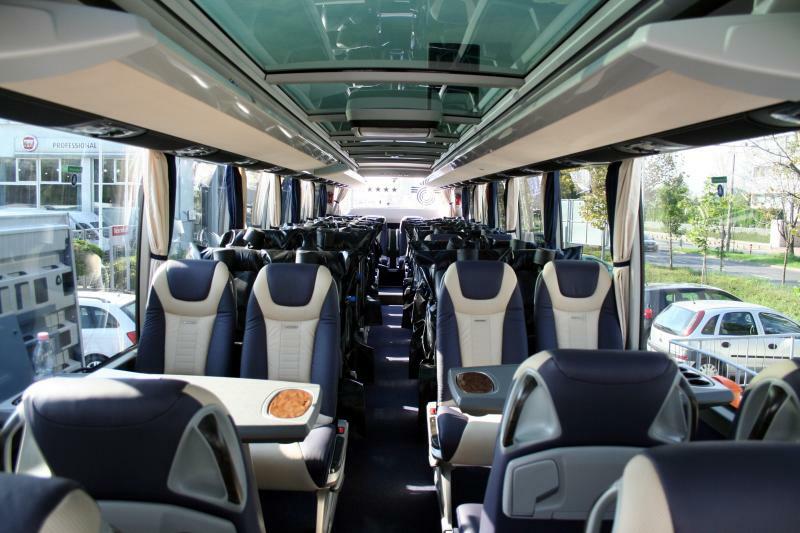 Prevost also designs these vehicles with three levels of quality. Their top of the line package features wood paneling for a more high-end look and feel. An additional benefit of these buses is their ample storage room. Above seat parcel storage and LED lighted storage below floor is perfect for the long journey. If you are chartering a coach full with 56 passengers, rest assured there will be room for any amount of luggage. Most models come standard with all the above features. If you are interested in learning more about specific features in the H3-45 model please contact a reservation specialist. Frameless windows on the Prevost models set them apart from the competition. These windows provide panoramic views outside the vehicle. This design is a favorite among groups traveling across the country and through the city. Most vehicles are loaded with entertainment options. From flat panel, wide screen HD TVs to Hi-Fi audio, the Prevost has you covered. If you are on a long trip and want to feel comfortable on these buses, recline your seat and enjoy the show. When stacked up against other models, the H3-45 is a fuel-efficient coach. Designers placed an emphasis on efficiency to reduce costs for the operator, which is passed down to the consumer. 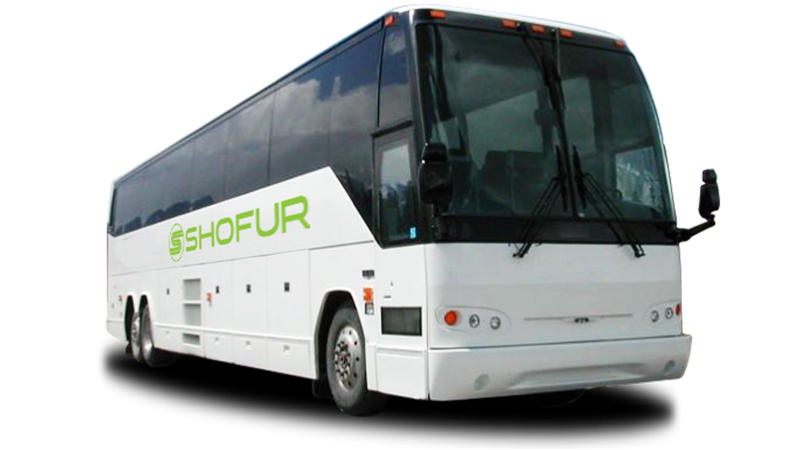 At Shofur, we appreciate manufacturers who place an emphasis on green technologies and fuel efficiency. The Music Festival: There is nothing like the experience of attending a large music festival or concert with friends. If you need transportation for a large group to Coachella in California, South by Southwest in Austin, or Ultra Music Festival in Miami we recommend Prevost. You want to enjoy the entire experience from the moment you leave your doorstep and listen to great music on the way. Hi-Fi audio makes the trip there an experience in and of itself. The Trade Show: Prevost is one of the most requested buses by corporations attending trade shows. Houston and Las Vegas are the largest markets for these luxury vehicles. If you place importance on employee comfort and productivity then these models are recommended. Power outlets keep laptops charged and free Wi-Fi makes sure you stay connected and productive throughout the trip. Prevost is a Canadian manufacturer and designer of motor coaches. The company is a subsidiary of automaker Volvo. Founded in 1924, the Prevost is one of the oldest manufacturers in the industry. The company currently employs more than 1,400 people across Canada and the United States. The X3-45 and X-3 VIP Entertainer models are also available from the manufacturer.